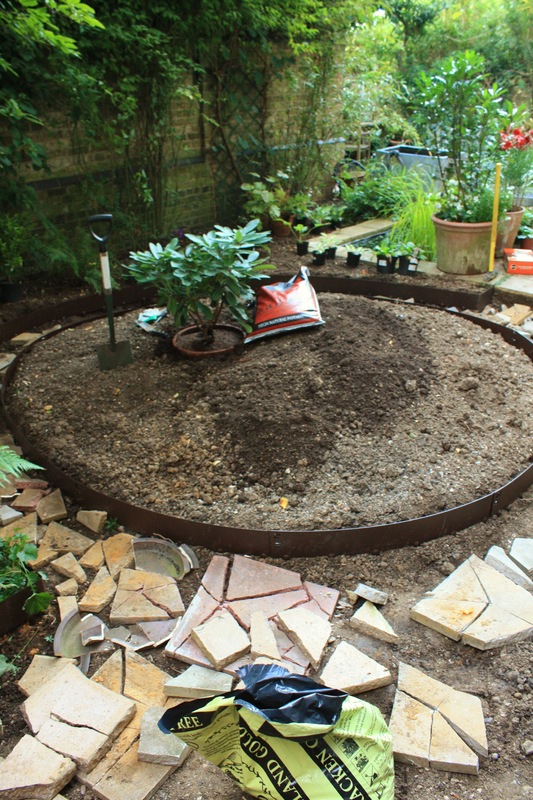 I have been very quiet about our London garden of late and deliberately so, for progress on the new woodland garden has been painfully slow. With a much needed holiday looming, the pressure is really on to get it completed. The army of new and old plants will wait no longer to get into their new quarters, especially as there’s no-one to mollycoddle them in our absence. So the metal edges are in and tomorrow the gravel arrives. Starting after we get home from work, we’ll be laying paths and planting until after dark. Good luck! We had the garden measured and surveyed yesterday and the thinking and planning is about to start. I cannot do heavy digging and lifting and will need help – it is going to be expensive and I am hoping to re-use some existing plants, and transfer others from the Suffolk garden which is bursting at the seams! I think gardens are expensive, unless you really can do every little thing yourself. However if it’s a job well done it will be worth every penny. I am also looking forward to London acting as an overflow for the seaside garden, although I want both to be distinctly different. Lots of hard work I’m sure, but it will look good I’m sure. Enjoy that holiday. I’m afraid it will probably have to fend for itself, but fortunately we have a lot of shade during the day. More concerned about the slugs and snails ravaging my hostas! Well, both gardens are very small and wouldn’t amount to even a quarter of an acre I imagine. Somehow they still manage to keep me busy!